30-year-old poker pro Alexander Ziskin has won event no. 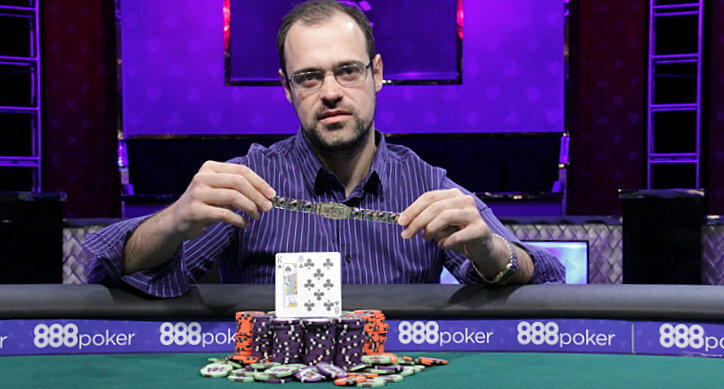 31 at the 2016 World Series of Poker, defeating a field of 1,476 entries in the $1,500 buy-in no-limit hold’em event to win his first gold bracelet and the $401,494 top prize. The final table lasted 459 hands and stretched over two days. Ziskin returned on the fourth day of the event to finish his heads-up battle against Germany’s Jens Grieme, which went 200 hands on day 3 before play was halted for the night. Grieme came into the final day with just over a 4-to-3 chip lead on Ziskin, but the two passed the lead back and forth several times down the stretch. The tournament ended with Ziskin doubling up in successive hands to take more than a 5-to-1 lead and leave Grieme with only 7 big blinds. In the final hand Grieme moved all-in from the button with the Q 10 and Ziskin called with the K 8 . The board ran out A 8 6 5 7 to pair Ziskin’s eight, securing him the pot and the title while sending Grieme to the rail as the runner-up with $248,067. Plenty of recognizable names made deep runs in this event including 2004 WSOP main event runner-up and current Master Chef contestant David Williams (12th – $24,718), Matt Stout (14th – $19,457), Justin Young (18th – $15,490) Konstantin Puchkov (19th – $12,473) and David Vamplew (20th – $12,473).